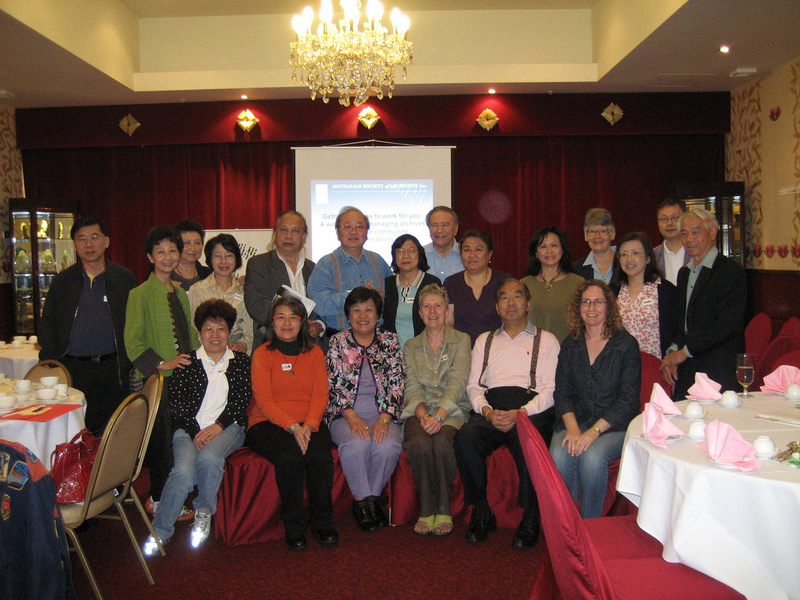 Last Saturday I had the pleasure of hosting an archiving workshop for Chinese community organisations at the Marigold Restaurant in Sydney’s Chinatown. The workshop had been funded by a federal government Community Heritage Grant from 2006 and was one of the many visions of the late Henry Chan (of the Chinese Australian Historical Society). Henry’s untimely death earlier in the year had meant the workshop hadn’t taken place as originally planned and it was good to finally see it finally happen. Sigrid McCausland, education officer with the Australian Society of Archivists, presented the workshop. In attendance were members of about 8 different Chinese community organisations, and a few ring-ins, totalling 20 in all. 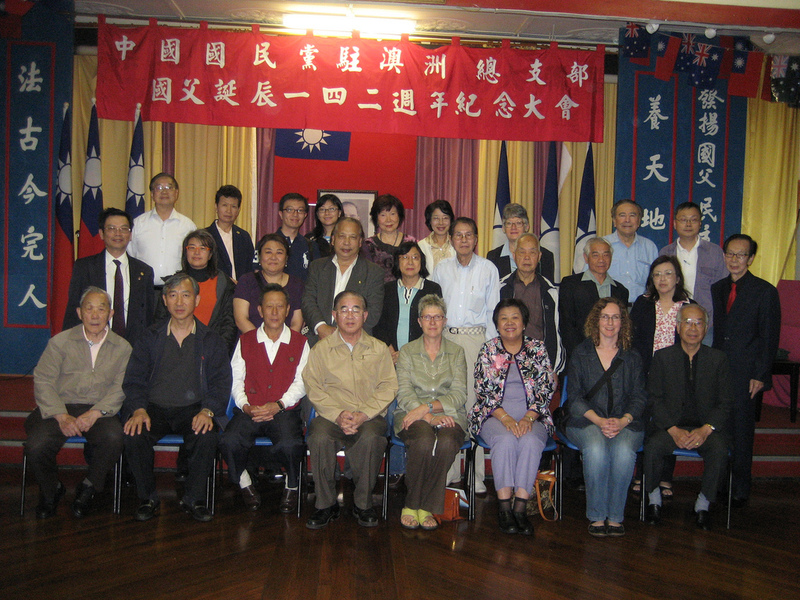 The organisations included the Chinese Women’s Assocation, the Sze Yup Temple Trust, the Sze Yup Society, Goon Yee Tong, Chinese Community Council of Australia, Chinese Australian Forum, Chinese Heritage Association of Australia, Chinese Historical Association of Queensland and the Chinese Australian Historical Society. They were a jolly bunch, with lots of wit and banter coming from the floor. Tony Pun, from the Chinese Community Council, amazed us with talk of his shed, biscuit tins and how archives really should be kept on the moon. More seriously, Sigrid’s presentation led us through some of the issues facing community organisations in terms of their current recordkeeping practices, as well as what to do with more historical records. She talked about what archives are, and why we should keep them; how to go about starting off an archive – developing policies and so on; how to record information about the archives; and finally how to look after them in terms of storage and preservation. It seemed that a real issue facing community organisations was having one central place where organisation records would be kept – there were lots of examples of how people would horde the records of their particular projects, or would keep records in their own homes because they didn’t trust what others might do with them. We referred to the National Archives’ booklet Keep it for the future!, which gives a basic overview of managing archives and is specially targetted to community organisations. The Australian Society of Archivist’s book Keeping Archives is the Australian archival bible and provides much more detailed information. 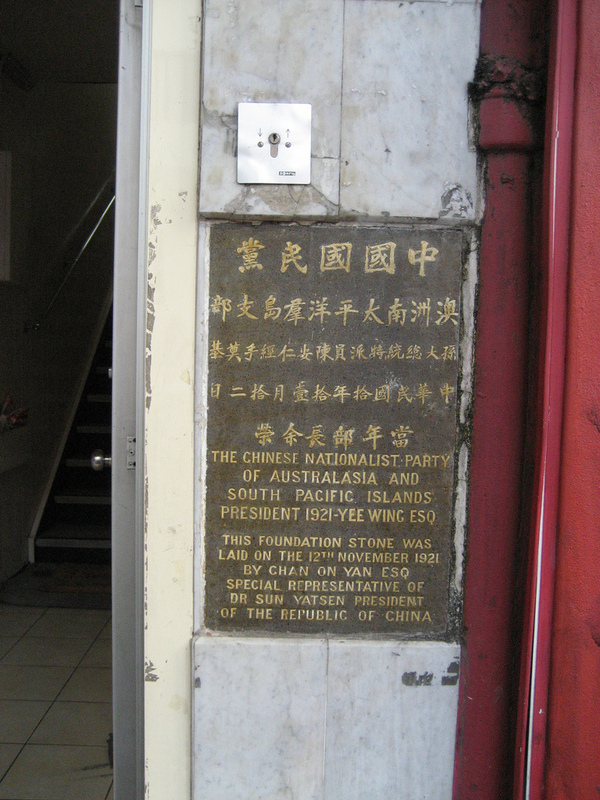 We finished the day with a visit to the Chinese Nationalist Party of Australasia (KMT) in Ultimo Road, Chinatown. The KMT were very generous in allowing us to have a tour of their wonderful building, opened in 1921, and to see the work that they had done as a result of Community Heritage Grants of their own. 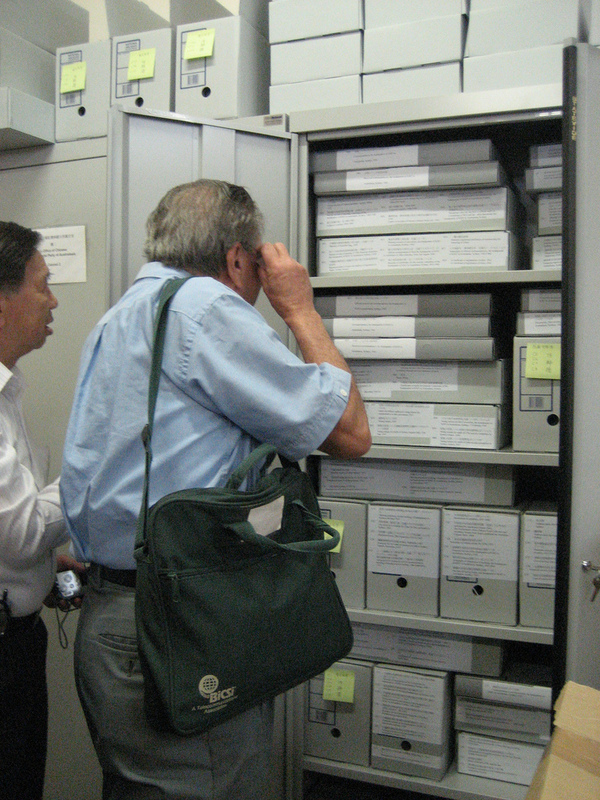 The grants allowed them to commission a significance assessment and preservation needs report (done by Mei-fen Kuo, Henry Chan and John Fitzgerald), and then to purchase archival storage and environmental control equipment. Mei-fen’s recent PhD thesis makes use of some of their material. The ground floor of the building is occupied by a Chinese medicine shop. The KMT offices are on the first floor, the hall where our group photo was taken is on the second floor, and then up again are rooms in which there are exhibits of historical KMT material. There are many interesting things – printing presses, publications, flags, a sign from the former Chinese consulate in Perth and lots of framed photographs on the walls. 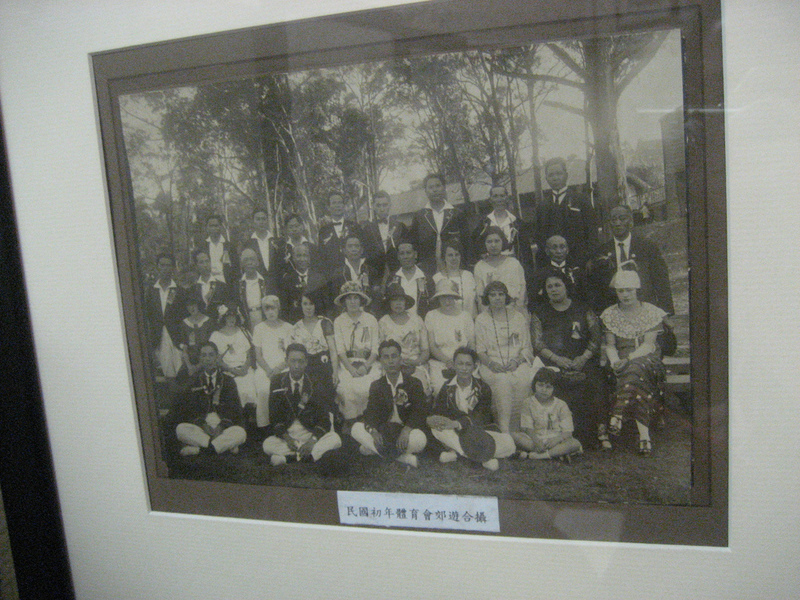 One of the things that fascinated me about the photographs was the number of images of dinners and social occasions which showed that these gatherings were also attended by people who looked distinctly un-Chinese, particularly women. Bang goes another misconception! 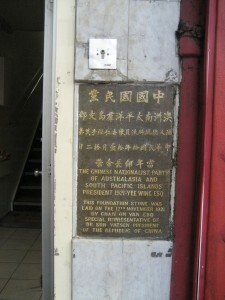 Early president of the KMT, Yee Wing (whose name is featured on the plaque next to the doorway of the KMT building), did, after all, have a white Australian wife and a gaggle of Australian children! You can see more photos of the workshop and the KMT visit in my Flickr site. Just follow the link.